I was surprised to learn that this structure is actually quite new - construction dates back only 30 years to 1978. This is St. George's Ukrainian Catholic Church at 20 East 7th Street at the corner of Taras Shevchenko Place. 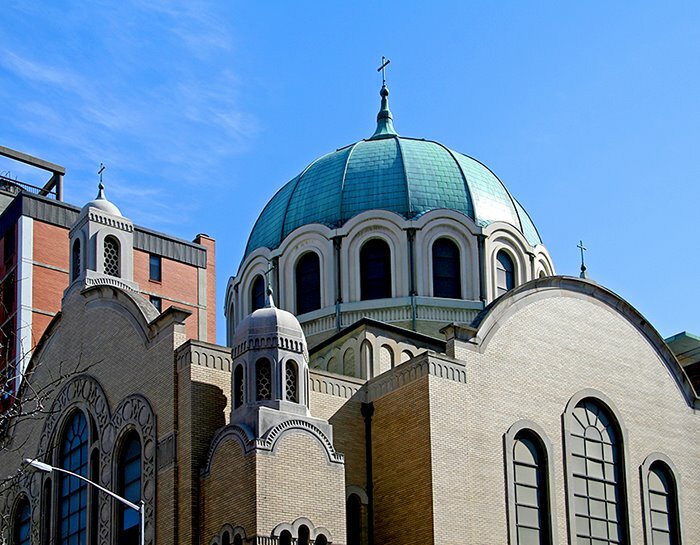 The Byzantine church with its large dome, designed by Apollinaire Osadca, is a landmark in this area of the East Village, which has a large Ukrainian community. The church stands out particularly in contrast to the surrounding lowrise, tenement buildings. It replaces an earlier church - read the history here. A neighboring project cross the street has been quite controversial - the short two-story Hewitt Memorial Building, belonging to Cooper Union, has been torn down and is being replaced with a 9 story building (equal in height to a 16 story residential building), to be completed in 2009, in time for their 150th anniverary. The new building is the NYC debut of architect, Thom Mayne, a Pritzker Prize laureate and a principal of the Los Angeles firm Morphosis. There has been some community acceptance owing to the new building's transparent features, permitting light and views - read about it here. Cooper Union (and others) have recently been involved in a number of building projects in the area- this is not the first recent neighborhood controversy. People resist change and opposition to new construction is the norm unless the thing being torn down is absolutely egregious and the replacement very much in keeping with surrounding architecture. Otherwise, in NYC, get ready for a community battle. I'm not saying that all new construction is good - to the contrary, I am a devout preservationist and love historic architecture. However, new construction is a reality anywhere. It's the design process and site considerations that make it such a thorny, contentious matter. Street Note: Taras Shevchenko Place is only one block long, between 6th and 7th Streets. Originally it was named Hall Street, then Hall Place. Ukrainian residents got the street renamed in 1978. Taras Shevchenko (1814-1861) was a Ukrainian poet, artist and nationalist.